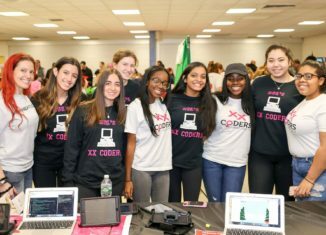 Hundreds of parents, children, students, teachers, and administrators across Dix Hills and nearby towns piled into West Hollow Middle School on December 5th in order to be a part of the Half Hollow Hills’ wonderful 2nd Annual Night of Code! This event consists of several displays, speeches, and hands-on activities for people of all ages to learn about the wonders of technology that we are witnessing all around us. The second annual Night of Code had displays ranging from the new Advanced Placement course, AP Computer Science Principles, to 5th grade Mathematics students to several different clubs, organizations, and nonprofits dedicated to educating others about computer science and technology. Mrs. Sapia is extremely correct here. The technology that younger generations are growing up with now is several times faster, more powerful, and easier to use than it was just twenty years ago. Children are given iPhones and computers before they can even speak, and this is changing the functionality of how our society works and what our future will look like. The Night Of Code is an excellent event that promotes this concept of using our technology for good: for innovation, creation, and progress. Robots like “Dot” and “Dash” can be likened to the robotic technology being used to perform microscopic neurosurgery, and the complex programming students have completed in a range of languages can be likened to creating artificial intelligence such as Siri. Who knows–maybe the next Elon Musk will come out of HHH’s very own halls!